The S.S. Deke Slayton II Cygnus OA-4 Cargo Craft departed the International Space Station after a 72-day stay to head towards the end of a highly successful mission that set a new record for the docked duration of a Commercial Resupply Craft and saw a number of firsts. 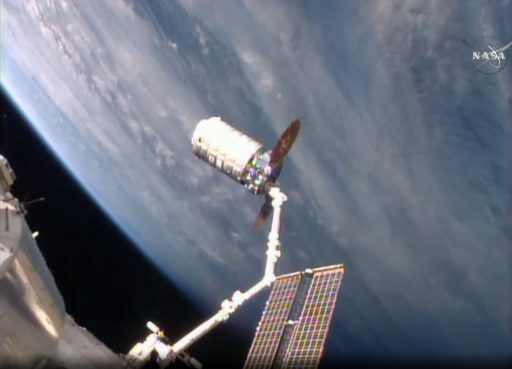 The Cygnus spacecraft was unberthed early on Friday and was released by the Station’s robotic arm at 12:26 UTC to begin a short free flight before conducting engine firings to set up for a destructive re-entry. The OA-4 mission marked the Return to Flight mission for Orbital ATK after the October 2014 Antares launch failure in which the original S.S. Deke Slayton was lost. Also, OA-4 is the first mission of the Enhanced Cygnus spacecraft offering a larger cargo carrier, hosting improved circular UltraFlex solar arrays and a modified service module structure. Cygnus OA-4 enjoyed a smooth ride into orbit on December 6, 2015 atop a United Launch Alliance Atlas V rocket as one of two interim Cygnus missions bridging a gap in Antares flights needed to fit the launcher with new Russian-built engines instead of the older modified NK-33 engines identified as a key suspect in the 2014 failure. 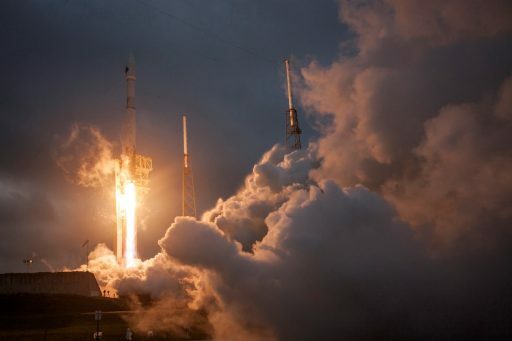 The partnership of ULA and Orbital ATK marked the first time two commercial companies cooperated in support of an ISS resupply mission in the continued commercialization of Low Earth Orbit missions from the U.S. The success of this commercial partnership is underlined by a rapid design and integration work between the spacecraft and launch vehicle operators, realizing the flight within one year. Atlas V completed a flawless mission, inserting its heaviest payload yet into a perfect orbit for a three-day catch-up with ISS that first saw the successful deployment of the new solar arrays before Cygnus went through a number of maneuvers to close in on ISS in its 400-Kilometer orbit. The 7,500-Kilogram spacecraft arrived in the vicinity of the Station on December 9 and closed in on ISS from directly below, arriving in a spot where it could be captured by the Station’s robotic arm under the control of NASA Astronaut Kjell Lindgren who was just days from returning to Earth after a five-month mission. Following the craft’s robotic capture, it was successfully installed on the Node 1 Nadir Common Berthing Mechanism – becoming the first Commercial Resupply Craft to use this particular port which was vacated earlier last year when the Permanent Multipurpose Module was moved to Node 3, giving ISS two berthing ports for USOS resupply vehicles to add redundancy and enable two missions to occur at a time. The use of the Node 1 berthing port also created the opportunity for an unprecedented portrait of the Cygnus spacecraft in close proximity to the Russian Soyuz, docked to the Rassvet Module also extending down on the Station’s Earth facing side. Cygnus spent 72 days attached to the Space Station, 12 days longer than specified in the contractual requirement between NASA and Orbital ATK. Over the course of the docked mission, the ISS crew unloaded 3,350 Kilograms of cargo items delivered by Cygnus ranging from food, clothes and supplies for the six-person Station crew, over maintenance hardware for ISS systems, to science facilities and experiment materials. It was the heaviest cargo load delivered by Cygnus owed to the larger cargo module and the power of the Atlas V rocket. Part of the OA-4 cargo was a new satellite deployment mechanism along with the first satellite to be released from the NanoRacks contraption, a new life science facility providing biology and other payloads with a controlled thermal environment, and a high-pressure gas tank to recharge the US-based air supply network. Science experiments delivered by Cygnus included a study of Packed Bed Reactors in microgravity to optimize future spaceflight systems relying on this type of reactor such as air scrubbers and liquid systems. Another study onboard Cygnus was BASS-M, the next in a series of combustion experiments conducted on ISS, this one looking at different fabric treatments and their resistance to burning in microgravity. Among the cargo delivered by Cygnus were 17 CubeSats to be deployed from ISS in March. When the delivered cargo items had been moved to ISS, the crew filled the pressurized cargo module up with around 1,500 Kilograms trash and no longer needed parts for disposal. The entire mission from launch throughout the docked stay of the spacecraft was a tremendous success. 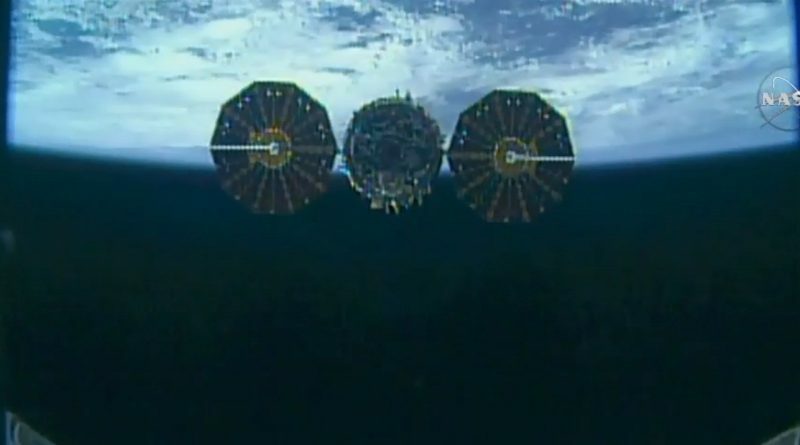 All of the new systems introduced by the Enhanced Cygnus worked as advertised, starting with the unfurling of the new circular solar arrays after Cygnus arrived in orbit, giving the spacecraft a new characteristic appearance as the only cargo craft currently making use of its type of array. The only very minor issue emerging during the stay of the spacecraft was a higher-than-expected degradation on an in-cabin fan, presenting only a minor inconvenience. As the OA-4 mission was slowly winding down, the ISS crew put in several disposal cargo loading shifts early in the week with the final items being placed aboard the vehicle on Thursday. Next, the spacecraft was buttoned up by the three USOS astronauts before its hatch was closed and the interface between the Unity module and the Cygnus spacecraft was outfitted by removing data and power jumpers, installing the Central Disk Cover and putting four Controller Panel Assemblies in place. Once Unity’s hatch was closed, the vestibule between the spacecraft was depressurized and underwent leak checks to make sure both hatches were holding pressure. 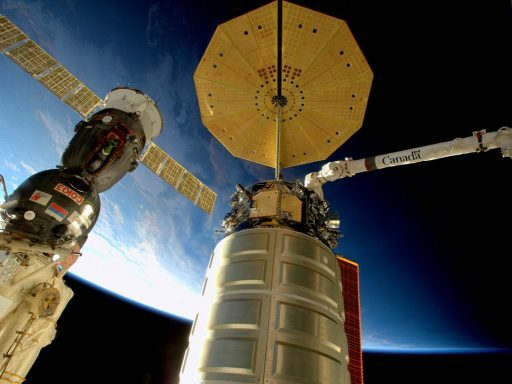 Canadarm2 had been grappled to Cygnus earlier in the week to be able to provide power and data connectivity through Cygnus’ Video and Data Grapple Fixture – a unique feature among the current USOS visiting vehicle fleet. On Friday, the crew members and Mission Control picked up operations with the unberthing of the spacecraft. The first step was the demating from Node 1 by releasing 16 Common Berthing Mechanism Bolts that were holding Cygnus in place. 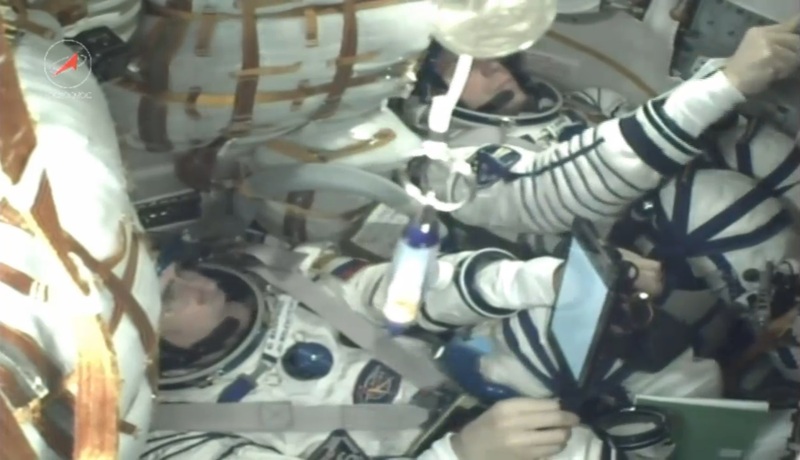 Commands for the unbolting were sent by Tim Kopra working from a Laptop computer inside the Cupola. Using four Controller Panel Assemblies, the 16 bolts were released in four groups of four in order to break the hard mate between the two spacecraft. With the bolts released, four capture latches were opened and Canadarm2 was in control of the spacecraft. Canadarm2 was commanded by ROBO controllers in Mission Control, slowly pulling Cygnus away from Unity to clear all structures so that the CBM pedestals could be closed. 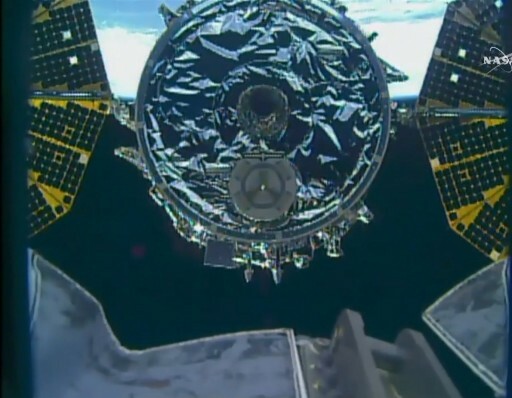 Holding at a standoff distance, teams paused to reconfigure the robotic arm for the transfer to the release position. Utilizing pre-programmed maneuvers, Canadarm2 was quick in maneuvering Cygnus to its release position, around ten meters from the modules of the International Space Station. With the 18-meter long arm in position, Tim Kopra – in charge of robotics – and Expedition 46 Commander Scott Kelly – handling communications and commanding of the Cygnus spacecraft, were given the GO to begin a series of steps to prepare for the release of the spacecraft. These operations included the re-positioning of cameras, the checkout of the Hardware Command Panel and the set up of the Cupola Robotics Workstation. 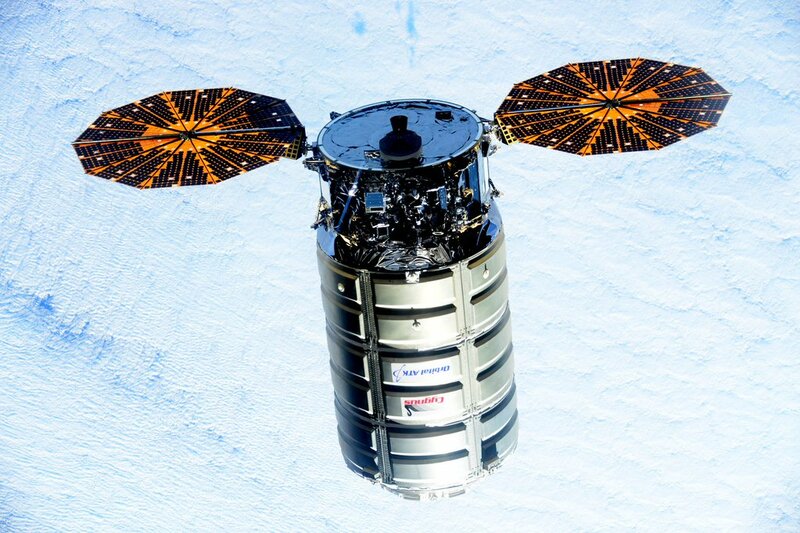 Meanwhile, Cygnus also underwent reconfigurations to prepare it for free flight, including the activation of navigation systems and the flight control system. The spacecraft started acquiring star tracker data for attitude determination and Cygnus was transitioned from Canadarm to internal power supply. Prior to release, the craft’s control system was switched to Free Drift to prevent any thruster firings during the release sequence. 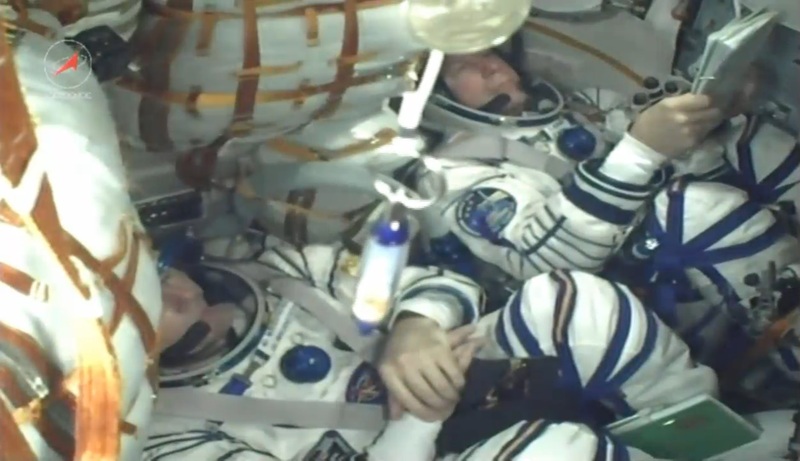 Waiting for proper lighting conditions, teams were holding until the opening of the release window stretching from 12:25 to 12:58 UTC. At Mission Control Houston and Orbital’s Mission Control Center in Dulles, controllers were polled and gave the final GO for release which was relayed to the crew as the final call from the ground, allowing them to work at their own pace to set up for release. For the release, capture latches and snares in Canadarm’s Latching End Effector were opened and the LEE was pulled away from Cygnus’ Power & Video Grapple Fixture. 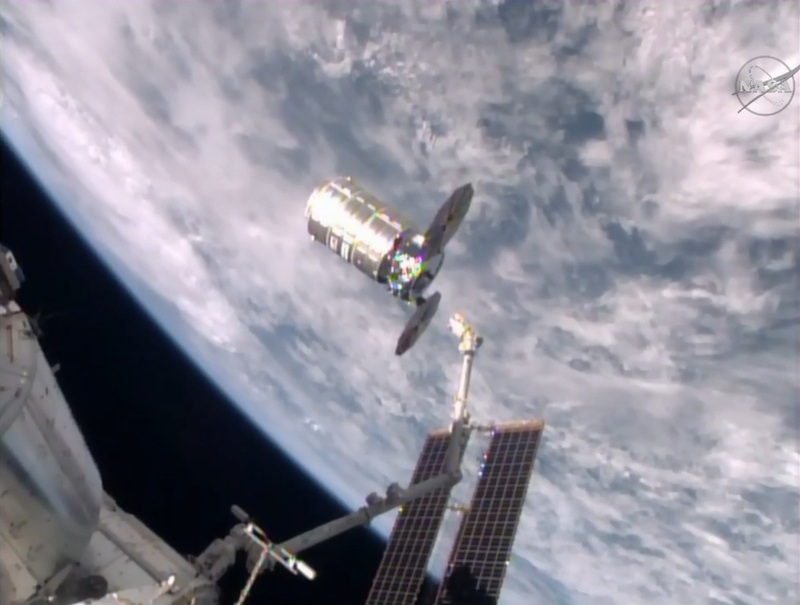 Release occurred on tine at 12:26 UTC while the complex was flying high above Bolivia, South America. Canadarm2 was positioned at a standoff distance of 1.5 meters to Cygnus and the spacecraft recovered from Free Drift through planned abort command sent to the vehicle upon which Cygnus initiated a two-minute departure maneuver. This Abort Command is part of the nominal departure sequence for Cygnus and initiates the actual departure of the spacecraft. Firing its reaction control system thrusters, Cygnus executed a pre-programmed posigrade maneuver to begin a slow departure. 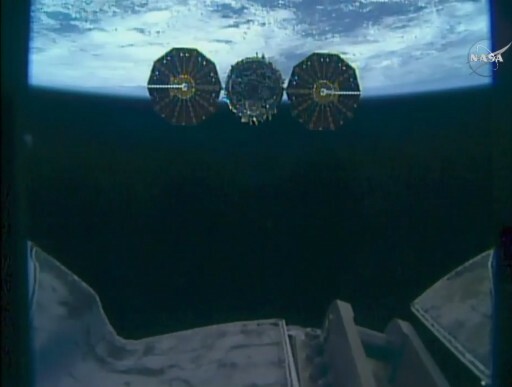 As part of this posigrade maneuver, Cygnus pulled out in front of the Space Station, departing the Keep Out Sphere within a few minutes of release. The vehicle exited the Approach Ellipsoid just after 13 UTC, marking the end of integrated operations between the NASA Mission Control Center and Orbital’s Cygnus Mission Control Center in Dulles, Virginia. Dulles now has full authority over the spacecraft, controlling it throughout its final day in orbit that are filled with maneuvers and test objectives. 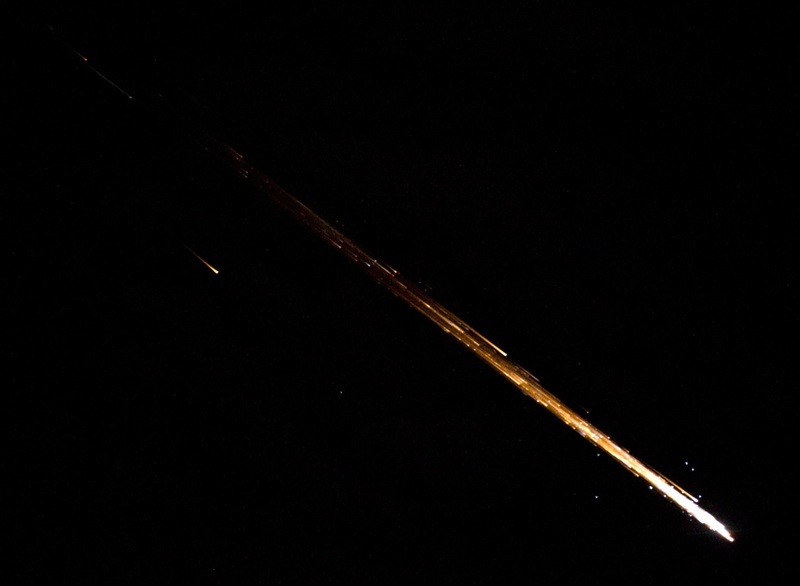 Once at a safe distance to ISS, Cygnus will conduct a pair of orbit-lowering maneuvers ahead of one final retrograde deorbit burn that will put the perigee well inside the dense layers of the atmosphere, enabling Cygnus to hit the discernible atmosphere at a pre-determined location over the Pacific Ocean. Re-Entry if set for Saturday with navigational warnings in place from 15 to 19 UTC. The end of the OA-4 mission will come when the Cygnus spacecraft passes around 80 Kilometers in altitude where aerodynamic loads will build up to a destructive force and friction will incinerate much of the spacecraft and its contents before impacting in a remote stretch of the ocean. With the completion of the OA-4 mission, Orbital ATK looks forward to the OA-6 mission – occurring out of sequence as OA-5 is set to be the first flight of Cygnus on the new Antares version this summer while OA-6 will again use the Atlas V rocket launched by ULA. The OA-6 spacecraft is finishing cargo loading operations and launch processing at the Kennedy Space Center at this time, targeting a launch on March 22 local time (March 23 UTC).